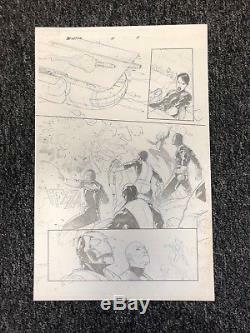 Esad Ribic X-Men Battle of the Atom Original Comic Art (Marvel Comics). Issue 2 Page 3 Featuring Cyclops, Storm, Ironman, Magneto, Beast, Maria Hill and more! SERIES: X-MEN: BATTLE OF THE ATOM. The item "Esad Ribic X-Men Battle of the Atom Original Comic Art (Marvel Comics)" is in sale since Friday, January 12, 2018. This item is in the category "Books, Comics & Magazines\Comics\Original Comic Art". The seller is "shuto1976" and is located in Bedford. This item can be shipped worldwide.